It’s time for the annual Great Backyard Bird Count! The Great Backyard Bird Count (GBBC) is the opportunity for bird enthusiasts of all ages — from casual bird watchers to serious birders — to participate in a massive counting of birds over a four-day period in the U.S. and Canada. Scientists then use the data from to study bird populations, what kinds of birds live in different areas, the environmental effects on bird migration patterns and how a species’ range shrinks or expands over a period of time. This year, the Great Backyard Bird Count takes place February 18-21, 2011. If you have 15 minutes at any time during the four days of the GBBC, you can take part in the event, led by the Cornell Lab of Ornithology and the National Audubon Society, along with Bird Studies Canada. This will be our third year of counting our winged neighbors around the Inn on Mill Creek. As a Mountains Region site on the North Carolina Birding Trail, we see lots of different bird species. 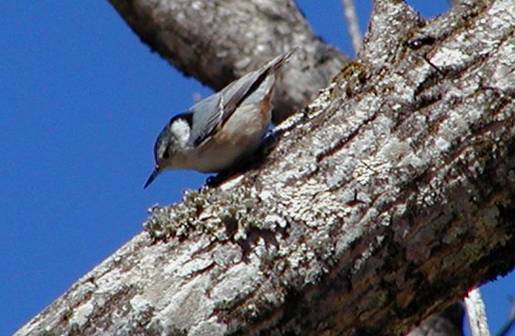 In our neck of the woods, this time of year is a busy one for Northern Cardinals, Tufted Titmice, Dark-eyed Juncos, Carolina Chickadees, White-breasted Nuthatches (like the beauty above who was spotted at the Inn last February), Pileated Woodpeckers, Yellow-bellied Sapsuckers and more. It’s very easy to participate in the Great Backyard Bird Count. All you have to do is count birds for at least 15 minutes on at least one of the days and submit a checklist to the Great Backyard Bird Count website for each count. The number of checklists each year is growing…last year, more than 97,200 checklists were submitted! North Carolina once again finished in a strong third place in the number of checklists submitted, only 283 checklists fewer than second-place California and 672 checklists fewer than first-place New York. Not bad! One nice thing about the Great Backyard Bird Count is that you can print off a bird list for your state or region to help you with identifying birds. Can you guess what bird took the honor of having the biggest number counted during the GBBC in 2010? Think Spring, and then check the GBBC’s top ten lists at http://gbbc.birdsource.org/gbbcApps/top10 for the answer.